Ice hockey skates  proved ankle support, protection against cuts from other skates, and should be comfortably sized. The steel runners on hockey skates should be sharpened regularly. 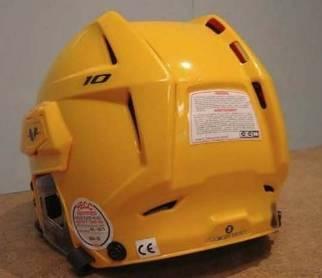 Specially designed helmets fitted with face guards reduce the risk of head injury  as a result of contacts with other players, the boards, or falls. Ice hockey is a heavy contact sport, even in the women's game where body checking is not permitted. As a result, pads are required to cover most of the body. These pads include shoulder pads, gloves, elbow pads, shin pads with hockey stockings, chest pads, padded shorts, athletic supporters and cups for boys and neck guards. Hockey sticks range in size according to the player's height. Taller players should opt for longer sticks. The size and angle or curve of the blade can vary as well, allowing for different types of shots or puck handling abilities. The puck is made out of rubber and is typically 1 inch wide by 3 inches in diameter, and weighs 6 ounces. There are heavier versions for training and smaller pucks for younger players available. Everything a goalie wears is more protective, and restrictive, than that of other players. Goalies utilize leg pads, larger helmets with greater neck protection, wider sticks, and a trapper or catching glove, which resembles a baseball first baseman¡¯s mitt. A blocking glove is worn on the hand holding the stick.